It is safe to say that Pontiac weathered the storm of performance malaise in the 1970s better than any other automaker. When all the others had given up, Pontiac continued to put its largest displacement and most powerful V8 motors into its performance flagship, the Trans Am. When Chevrolet dropped the big-block (454 CID) V8 option at the end of the 1974 model year on the Corvette, the Corvette would soldier on with a 350 CID V8. The Camaro lost its large displacement big-block (402 CID) V8 even sooner (at the end of the 1972 model year). Over at Ford, the Mustang lost its large displacement big-block at the end of the 1971 model year when the 429 CID V8 was removed from the Mustang option list. By 1975 the Mustang had as its top motor a 302 CID 2V (2 bbl.) V8. The story was the same for all the other automakers (who made performance cars), except at Pontiac. Pontiac continued to offer performance-oriented large displacement 400 and 455 CID V8s in its Trans Am during the entire 1970s. Only GM forcing Pontiac to cancel the 400 and 455 caused this successful trend to end, so Pontiac was left with only its 265 CID (4.3 liter) and 301 CID (4.9 liter) V8s for the 1980 model year. Pontiac not wanting to give up under the circumstances decided if they no longer had a large displacement V8, a turbo 301 V8 would be the next best thing. With the 1980 and 1981 (LU8) 4.9 liter turbo V8 producing 210 and 200 horsepower respectfully, the Trans Am could still remain a highly regarded muscle car. Pontiac engineers were excited about the release of the all-new third generation Trans Am for the 1982 model year. The 1982 Trans Am was to be a much lighter car, weighing at least 500 lbs lighter than the husky second generation Trans Am. 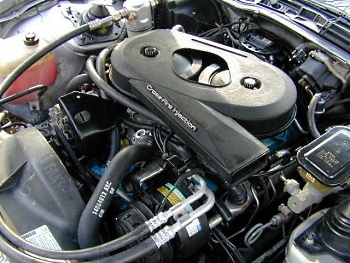 With Pontiac engineers having planned the carryover of the 200 horsepower 4.9 liter turbo (4 bbl.) V8 for the top-of-the-line 1982 Trans Am, the performance future of the Trans Am seemed bright. With the massive weight loss for 1982 it was expected that the 4.9 turbo powered 1982 Trans Am would hit the quarter-mile in the low-15 second range and perform 0-60 mph in around 7.0 seconds which would have made the 1982 Trans Am the fastest U.S. production car in 1982. Unfortunately this was not to be, GM put a wrench in Pontiac’s plan and cancelled Pontiac’s 4.3 and 4.9 liter V8s making 1981 their last year of production. Pontiac, caught in a big pickle was forced to pick a new engine for the 1982 Trans Am from GM’s new corporate engine list (this was a new policy which began in the 1982 model year). Only three GM divisions (Chevrolet, Oldsmobile, and Cadillac) made V8 engines as mandated by GM’s new corporate engine policy. Cadillac’s new 4.1 liter V8 was for Cadillac use only so it was not in play, with its mediocre 125 horsepower rating it was no great loss. Pontiac engineers could have gone with Oldsmobile’s 5.0 (307 CID) V8. However Pontiac went with the third choice which was a 5.0 liter (305 CID) V8 produced by Chevrolet. Since the Chevy 5.0 liter V8 was also slated to be the powerplant of the all-new 1982 Camaro Z28, it seemed to be logical choice since both the Camaro and Firebird share the same f-body platform. However Pontiac’s final decision was swayed by the abundance of aftermarket performance parts available for the Chevy small-block V8 family which the 5.0 liter was a member. Worth noting is that Pontiac toyed with the idea of using Buick’s turbo 3.8 liter (4 bbl.) V6 in the 1982 Trans Am, but decided against doing so. Ironically a slightly modified version of the SFI (Sequental Fuel Injected) and intercooled version of the turbo 3.8 V6 was the standard engine in the limited edition 1989 20th Anniversary Trans Am. As luck would have it this Trans Am would be the fastest Trans Am of the 1980s. To say that the second generation Trans Am was a successful car would be a gross understatement. The Trans Am was the “it car” during the 1970s, if you wanted a hot performance car that was the envy of all, nothing was better to own than a Trans Am. 1979 was the pinnacle year for Trans Am sales, Pontiac sold 116,535 units for that model year alone. The hardest task in the automotive business is replacing a successful car. In most cases the result is a car that is not as good as the car it is replacing. In other words it is hard to follow up a hit, and lightening usually does not strike twice. Pontiac and GM knew this; it is probably part of the reason the Trans Am received only slight revisions from 1970 to 1981. When Trans Am sales started to slide by 1981, it was the right time for a replacement. Pontiac engineers wanted to bring the Trans Am into the 1980s and beyond with the 1982 Trans Am. Pontiac gave buyers a glimpse of the Trans Am’s aerodynamic future with the 1979-1981 Trans Am which was the first Trans Am to have an aerodynamic front-end. Where past Trans Ams were made to blast through the wind with large displacement V8s, the 1982 Trans Am was made to cheat the wind with superior aerodynamics. Engineers sculpted the body lines giving the Trans Am a very modern looking wedge shape. 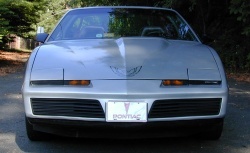 The front-end was extremely aerodynamic and used the first ever pop-up headlights on a Trans Am which allowed the front-end to be a lot lower and more aerodynamic than the new 1982 Camaro (which shared the same f-body platform). The Trans Am had a very steeply raked (aerodynamic) windshield which was one of the first of its kind back in 1982 but is now the standard among most cars. There was a new opening rear hatch with a functional rear wing spoiler attached. The new Trans Am still had some of the visual cues of previous Trans Ams so it looked the part of a modern Trans Am. In spirit the 1982 Trans Am was Pontiac’s version of the elegantly styled Ferrari Boxer or 308, it still had a very muscular look Trans Am buyers expected but it was sleek and chic. Gone were the wild spoilers, air dams, full-size hood bird decal, and the beloved shaker hood scoop (which where were all Trans Am cornerstones). Instead were very stylish understated spoilers that blended with the lines of the car. The decals were understated especially the hood and sail panel bird decals which were small and could only be seen when viewing the car from up close. Even the traditional Trans Am air extractors on both front fenders were understated. There was no chrome on the 1982 Trans Am, all trim pieces including the side mirrors and even the rear spoiler were painted in flat black. The overall look of the car was European in nature. The coefficient of drag (Cd) of the Trans Am, was an industry best for 1982 at an ultra low .323. Even today almost 30 years later a Cd of .323 is still very impressive. By the 1984 model year with the addition of added lower body spoilers/air dams the Cd figure for the Trans Am would drop to an even more impressive .29. The superior aerodynamics was an important component in the Trans Am’s evolution as a performance car. By the 1980s with the vast improvement of aerodynamics, performance tires, suspensions, and gearing; performance cars now could achieve top speeds in ranges close to what was once race car territory. With muscle cars from the golden era, by the time they finished the quarter mile most of them were out of gear (with not having an overdrive gear) and their poor aerodynamics also severely limited their top speeds even if gearing was not an issue. There were a few muscle cars that were made with slippery lines (to meet NASCAR competition rules) such as the 1969 Dodge Daytona which were exceptions to this rule, but by-in-large muscle cars from this period were not going to be setting any top speed records. The 1982 Trans Am was different in that its aerodynamics was such that the faster it went the lower its center of gravity was (since air passing over the car would push the car closer to the road the faster the car went) – this meant the car became more stable the faster it went. However for 1982 the two 5.0 liter V8 motors would only take the Trans Am to just below 130 mph, where it ran out of gear (due to a lack of overdrive) causing the tach needle to redline in the danger zone. However turbo guru Gail Banks produced in very low numbers a turbo Trans Am for 1982 (powered by a twin turbo small-block Chevy 350 CID V8) which approached race car top speed territory. By 1984 Gail Banks offered a higher horsepower twin turbo Trans Am which topped out at 200 mph proving that Pontiac exterior designers had earned an “A+” in aerodynamics with the design of the third generation Trans Am. The Trans Am had two engine choices for 1982; GM’s LG4 V8 which was a small-block Chevy 5.0 liter (305 CID) 4 bbl. V8 rated at 145 horsepower and 245 lbs/ft of torque. This engine was smooth and moved the light Trans Am well, however a tire burner it was not. Performance was good for its era with 0-60 mph times at around 10 seconds and a quarter-mile time in the 17 second range. The LG4 came standard with GM’s TH200C 3-speed automatic transmission, and optional was a 4-speed manual transmission. A 3.23 rear axle ratio was standard when the LG4 was equipped with the 4-speed manual. Back in 1982 the Trans Am even equipped with the LG4 was one of the faster cars that you could buy. Emissions and government regulations had sucked the power out of most V8s by this time, if you had a car that went 0-60 mph in 10 seconds or less you were lucky. As a comparison the 1982 Mustang GT came equipped with a 157 horsepower 5.0 liter 2V H.O. V8 when equipped with a 4-speed manual transmission and with a 120 horsepower 4.2 liter 2V V8 when equipped with a 3-speed automatic transmission. So in this light a 145 horsepower V8 does not seem too bad. Optional was a Cross-Fire fuel-injected variant of the 5.0 liter V8 which produced 165 horsepower and 245 lbs/ft of torque. This motor was designed by Chevrolet; it was a modern honor to the late 1960s high-performance racing 302 Cross-Ram V8. The design was similar with an intake manifold with a fuel/air mixture device on each side of the manifold. For the Cross-Ram’s case it was dual high performance 4 bbl. carburetors, in the Cross-Fire system’s case it was in the form of dual single throttle body Injectors (TBIs). It was a small displacement version of the L83 5.7 liter (350 CID) V8 Cross-Fire system in the 1982 and 1984 Corvette which produced 200 and 205 horsepower respectfully. The (LU5) 5.0 liter Cross-Fire motor shared the same intake manifold and hot cam as the L83. The LU5 had a 9.5:1 compression ratio which was very high by 1982 standards. On paper the Cross-Fire system appeared to be a high-performance tire burning motor, but in reality it was not. During this time the EPA’s Corporate Average Fuel Economy (C.A.F.E.) standards were ever tightening and US automakers which at the time all had policies of 100 percent compliance since not doing so meant very expensive gas guzzler taxes. Foreign automakers like Porsche and Ferrari just passed the gas guzzler taxes to its customers who could easily afford the added sticker price. With the U.S. in a bad recession back in 1982, a car with too high a sticker price was the equivalent of a death warrant. So GM was walking a very thin tight rope trying to meet the stringent EPA standards while keeping its customers happy. So the LU5 was a compromise, a V8 with enough power to please performance buyers and yet efficient enough to keep the death yielding gas guzzler taxes away. The LU5’s choke point was the restrictive aluminum intake manifold that had a max flow of 475 cfm (same was true with the 1982 and 1984 Corvette’s Cross-Fire motor). Performance Plus Systems (now defunct) in recent years produced a replacement aluminum intake manifold called the X-Ram which flowed an amazing 1440 cfm. This intake as was to be expected really livened up the Cross-Fire motor and gave it a nice infusion of needed horsepower. The stock LU5 to its credit produced 8 horsepower more than the best Ford had to offer with the 1982 Mustang GT. Motor Trend magazine (January 1982) test drove a LU5 equipped Trans Am and achieved a 0-60 mph time of 8.89 seconds and a quarter mile time of 16.75 seconds. Back in 1982 this was fast, however slightly slower than the 5.0 liter 2V H.O. V8 powered 1982 Mustang GT. Part of the reason was the Mustang GT even with a slight horsepower deficit weighed less than the Trans Am and was equipped with a 4-speed manual transmission for its hottest motor. The LU5 5.0 liter V8 only came equipped with the TH200C 3-speed automatic. It was part of the compromise. However it was not a bad compromise since the LU5 Trans Am was one of the fastest American cars available for 1982. The exhaust system for 1982 was fairly free-flow; it had a single large catalytic converter which was par for the course since 1975 even on performance cars. Behind the catalytic converter the exhaust exited out dual resonators to two separate exhaust pipes (located below opposite ends of the rear bumper), giving onlookers the illusion of a true dual exhaust system. As an added bonus the exhaust system was old school muscle car in sound. It made a deep loud rumble that turned heads, and would put a smile on any muscle car fan’s face. Pontiac engineers cleverly found a use for the carry over 1980-1981 turbo hood scoop which originally was carried over to allow height clearance for the 4.9 turbo that never made it into the engine bay. The hood scoop was fully functional for the LU5 (this meant the turbo hood was standard on the LU5). The rear facing portion of the hood scoop had a solenoid driven flap that opened up as the throttle approached the wide-open position. When the driver mashed the throttle to the floor, a beautiful ram air sound could be heard; it was a sound not heard on the Trans Am since 1972 (which had previously been the last ram air equipped Trans Am). The LG4 equipped Trans Am came standard with the base Firebird flat hood. The turbo hood could be ordered on the LG4 Trans Am but the hood scoop was closed; the LG4 equipped Trans Am unfortunately would have to wait until 1983 to get the ram air option. Pontiac may have been forced to compromise on its engines however there was no compromise in the area of handling. The WS6 or WS7 equipped 1982 Trans Am could obtain .83 g on the skidpad, making it arguably back in 1982 the best handling car in America. The 1979 to 1981 WS6 equipped Trans Ams could come close to this .83 g figure however the overall feel was still of a big linebacker when it hit the turns. With the 1982 WS6 or WS7 Trans Am the feel was of a nimble running back giving the driver the feeling of complete control in even the tightest of turns. As a comparison Motor Trend magazine recently tested a 2009 Dodge Challenger R/T which obtained .82 on the skidpad. The LU5 Trans Am came standard with what Pontiac called the “performance package” but listed on the build sheet as the WS7 package which included: a 2.93 ratio limited slip rear axle, performance steering box, stiffer springs, larger anti-sway bars, and 15×7 inch turbo cast aluminum wheels/P215-65R15 Goodyear Eagle GT tires. The WS6 package which was available in both the LU5 and LG4 equipped Trans Ams, was fairly complete and had what was needed to out handle the competition. However for those wanting a little more there was the WS6 package which had all the WS7 goodies along with rear-disc brakes and a more performance oriented 3.23 ratio limited-slip rear axle. To further confuse, towards the end of the 1982 model year demand for the WS6 package was much greater than Pontiac expected; it ran out of rear disc brakes on the assembly line. Pontiac filled the WS6 orders by using all WS6 components except the rear disc brakes which were replaced with the Trans Am’s standard rear drum brakes. Pontiac in turn changed the designation on these special late model year cars from WS6 to WS7. The end result was the existence of some WS7 equipped 1982 Trans Ams with 3.23 rear axle ratios. 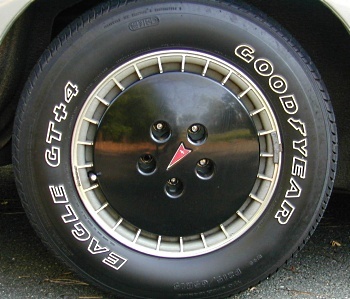 The base LG4 Trans Am came equipped with 14×6 inch turbo cast aluminum wheels and P205-70R14 Eagle GT tires. Most Trans Am buyers opted for the upgraded 15×7 inch turbo cast aluminum wheels and P215-65R15 tires along with the turbo hood option. Finding a surviving LG4 1982 Trans Am with 14 inch turbo cast wheels and a flat hood is almost near impossible these days since very few were produced. Worth noting there were some Trans Ams with the 15×7 inch turbo cast wheels that came equipped with Uniroyal tires instead of the Eagle GT tires. Both the 15×7 and 14×6 inch turbo cast aluminum wheels came standard with aero wheel covers in either black or silver (the silver wheel covers were not popular, not many were made). The aero wheel covers looked really sharp but had the added functionality of helping the Trans Am to achieve such a low coefficient of drag. As nice as these aero covers looked they are hard to find on surviving 1982 Trans Ams, most aero covers over time had the back side connection areas (where they attached to the turbo cast wheels) wear down from the removal and reattach process (when removing a wheel, it was necessary to remove the aero wheel cover to get the lug nuts off). The wearing down of the connection areas of the aero wheel covers eventually led to their liberation from the turbo cast wheels during driving. The end result in most cases was lost aero wheel covers. It is very hard to find any survivors these days, with no replacement ones available from GM or any aftermarket company. Most owners are left to search high and low for what very little supply of surviving aero wheel covers still exist. Hint: any company who makes in the future exact reproduction offerings of these wheel covers will make a killing. Fortunately there is an easy fix for owners that still have these wheel covers, it consists of the application of duct tape to the worn down connection areas. Any owners reading this, the first warning sign that an aero wheel cover is about to be liberated is a rattling sound. With the duck tape solution the rattle disappears and the aero wheel cover has a snug fit preventing any future liberation. Braking was also world class especially with the WS6 package’s four-wheel disc brakes. Motor Trend (January 1982 issue) tested a WS6 equipped 1982 Trans Am which took only 141 ft. to stop from 60-0 mph. As a comparison, Motor Trend magazine recently obtained 135 ft. from 60-0 mph stop test with a 2009 Dodge Challenger R/T. Since the exterior was so modern, Pontiac engineers came up with a modern interior befitting of the new exterior. The dashboard looked like a jet fighter cockpit with every imaginable gauge and readout available. Though there were many, all gauges were laid out in a clean manner which was easy to read. The dash was black giving it a SR71 stealth type look. 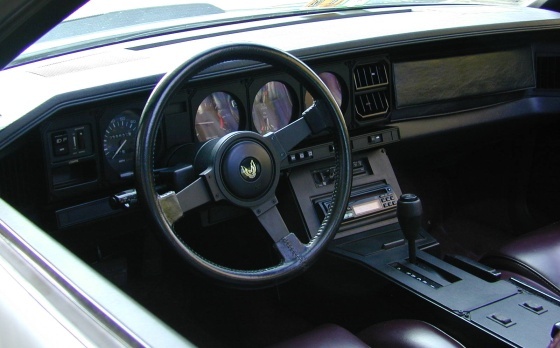 The modern dash design layouts from the best of Europe including Ferrari and Lamborghini looked outdated compared to the new Trans Am’s dash design. A center console was standard on the Trans Am which housed either an automatic or manual transmission shifter. When ordered with power windows and power mirrors the Trans Am had these controls in the center console which were very easy to reach. The power lock buttons were mounted on each door when power locks were ordered. There were a plethora of options available for the Trans Am; even overhead map lights, a power driver-side seat, and a power antenna option were available. Pontiac became well known by the late- 1970s for loading up Trans Am with many luxury and power options. Pontiac understood that Trans Am buyers wanted performance but they also wanted their Trans Ams loaded with luxury and convenience options. Of course a buyer could always order a stripper car with no options but that was a rarity. It was the Chevrolet Z28 buyers who tended to prefer not many options and stripped down interiors. For 1982 Pontiac kept the trend going, they offered a base interior in the Trans Am but like the 14×6 inch wheels and flat hood, it was shunned by most buyers. Instead most buyers opted for the sporty yet very plush velour cloth seating. And for those buyers who clamored for a step above that, there was an available leather seating option. A Trans Am favorite was also available on the 1982 model; T-tops which the Trans Am almost single handedly made into an automotive icon were available and bigger in size than ever. They now were more easily storable in a bag that was attached to the rear flat cargo area. Access to this bag was through the large rear opening hatch. The opening rear hatch was a nice addition and smart buyers ordered the optional rear windshield wiper and defroster for their rear hatches to keep visibility good during inclement weather. Base price for the 1982 Trans Am was just under $10,000 which gave a buyer a lot of bang for the buck. An aggressive checking off of the option boxes on the order form could easily give a buyer a 1982 Trans Am that approached the $15,000 territory. Even still a buyer got a lot of car for the money not to mention looks from spectators. The 1976-1981 Y82/Y84 black and gold Special Edition Trans Ams were revered by Trans Am fanatics. A 1977 Y84 Trans Am was made famous in the original Smokey and the Bandit movie. Pontiac was not about to stop this successful run for 1982, so it introduced a new black and gold Y84 Trans Am for 1982 with a new twist. This new 1982 Y84 Trans Am would be called the Recaro Trans Am. The name was derived from the Recaro front seats which were only available on the Recaro Trans Am. The seats only came in one color – charcoal. All Recaro Trans Ams had black exteriors with gold accents and decals. The Recaro Trans Am could only be ordered with the LU5 V8 or the LG4 V8/with the manual transmission. The 1982 Trans Am is most famous for its appearance on the hit TV show Knight Rider where it shared the role as TV star with David Hasselhoff (or better known as the Hoff). It was not the campy acting or even Hoff that kept viewers watching but it was the slick all black modified (talking) Trans Am called K.I.T.T. To this day it is one of the most recognizable TV or movie cars. K.I.T.T. replicas in large numbers can be seen at car shows across the nation. With Knight Rider reruns more popular than ever, the 1982 Trans Am’s popularity will continue for many years to come. Even if there was never a Knight Rider TV show, the 1982 Trans Am would still hold a special place in automotive history. It was an innovative car that rebounded Trans Am sales and brought the Trans Am into the 1980s and 1990s. The handling and braking capabilities of the 1982 Trans Am were the envy of auto world back in 1982. The aerodynamics would also be copied by many automakers in the years that followed its introduction. And there was enough grunt under the hood to give buyers performance at a time when performance cars were out of vogue. It kept the performance fires burning at Pontiac and allowed the passage of faster Trans Am models that came after. Not to mention it was a big sales success. Though it was introduced in January 1982 a few months after the official start of the 1982 model year, the 1982 Trans Am still sold an impressive 52,962 units which was a big jump from 1981 Trans Am sales. With the massive escalation of prices for second generation Trans Ams, collectors and hobbyists are now starting to focus on early third generation Trans Ams. Mint conditioned 1982 Trans Ams can be still had for under $10,000. With the recent escalation of the 1983 Daytona Pace Car edition Trans Am and the 1984 15th Anniversary Trans Am into second generation Trans Am price territory, it is only a matter of time before the 1982s begin to flow suit. The real testament to the 1982 Trans Am is the fact that even almost thirty years after its introduction it looks more modern and aerodynamic than the current field of new rear-wheel drive muscle cars. It was indeed a car well ahead of its time – a suave aerodynamic warrior. Special Note: the silver (LU5) 1982 Trans Am shown in this article belongs to Pete Dunton, the article’s author.